Are we really in the Millennium now? Don’t let the title of this article scare you. You don’t have to be a space scientist to understand the points I’m going to make. I know that words like Amillennial are downright scary, and I realize that most people don’t know the difference in a millennium and a millipede. I hope you will stay with me and not let your eyes glaze over, because what I have to say in this article is very important. It has to do with the way you view the end times and the way you live your life right here and now. Let’s begin with some definitions to clear the air. The word, millennium, means one thousand years. It is a combination of two Latin words mille (thousand) and annum (years). The odd term, amillennial, literally means “no one thousand years.” In the Greek language one of the ways of negating something is to put the letter “a” in front of it. It’s like using the letters “un” in English for example, ethical versus unethical. Some crazy theologian somewhere along the way came up with the idea of negating two Latin words with the Greek method of putting an “a” in front of them, and he came up with the highfalutin word, amillennial. So, an amillennialist is a person who does not believe in a future one thousand year reign of Jesus. Now, that’s simple enough, isn’t it? I happen to know a lot about this particular end time viewpoint, because I grew up with it. It was the only view I knew about until I was 30 years old (which, come to think of it, was almost 30 years ago!). The viewpoint is a very important one because it is the predominant concept of end time events in Christendom today. It is the official view of the Roman Catholic Church, and it is the doctrine that is held by the majority of mainline Protestant denominations. The view holds that the current Church Age will end abruptly with the appearance of Jesus for the redeemed. At that point the redeemed will be resurrected in spiritual bodies, the unrighteous will be consigned to Hell, the material universe will cease to exist, and the redeemed will take up residence eternally with God in Heaven. The viewpoint is illustrated below. The amillennial view was developed in 400 A.D. by St. Augustine. It was adopted by the Roman Catholic Church in 431 A.D. at the Council of Ephesus. Premillennial literally means “before the thousand years.” The title refers to the fact that this viewpoint places the return of Jesus before a future one thousand year reign upon the earth. As you can see by comparing the charts, there is considerable difference between the two viewpoints. 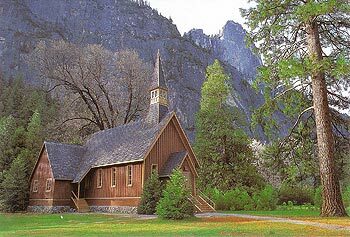 The premillennial view that had been held by the early Church Fathers did not envision history ending with the completion of the Church Age. Instead, the Church Age would be followed by a seven year period called the Tribulation, and this time of unparalled horror on earth would ultimately give way to the thousand year reign of Jesus. Another significant difference is that according to the premillennial view, the redeemed would live eternally in glorified bodies on a new earth. Augustine’s view, which was based on a spiritualization of Scripture, was quickly adopted by the Roman Catholic Church because it gave enhanced importance to the Church. It enabled the Church to claim that it was the fulfillment of all the kingdom promises in the Bible, and therefore it had the right to rule over all the nations of the earth. It also enabled the Church to claim that it was the new Israel, replacing the old Israel composed of the Jewish people. The Jews were dismissed as a people divorced by God. Their kingdom promises had been inherited by the true Israel, the Church. The new view also laid the foundation for the head of the Church to claim that he was the “Vicar of Christ” on earth that is, the representative of Christ’s reigning authority over the planet. Augustine’s new view obviously provided some philosophical advantages to a Church that was struggling to assert itself. But the view raised some very serious theological questions because it so clearly violated what the Bible literally taught about the end times. Let’s consider some of those questions. 1) Where is the Millennium? — This is a rather obvious question, but Augustine’s answer was surprising. Instead of denying outright that there would ever be a Millennium, he argued instead that the Millennium began at the Cross and would continue a thousand years until the return of Jesus. Later, when the Lord failed to return after a thousand years, amillennialists simply spiritualized the thousand years to mean an indefinite period of time from the Cross to the Second Coming. Note carefully that Augustine did not deny the Millennium; he simply redefined it to mean the spiritual reign of Christ through the Church during the Church Age. That means we are in the Millennium now and have been for almost 2,000 years, and that creates a major problem for amillennialists. For you see, when you read the Bible’s prophecies about the Millennium, there is no correspondence between them and the reality of the world in which we live. We live in a world that is rotten to the core. The Bible says that during the Millennium, “the earth will be flooded with the knowledge of the glory of the Lord as the waters cover the sea” (Isaiah 11:9; Habakkuk 2:14). The nations of the world today are all in rebellion against God and His Anointed One. The prophecies say that during the Millennium the nations will all be in subjection to the Lord and will glorify His name (Psalm 22:27-31). If the Lord is reigning over the nations of the world today, He is doing a very poor job of it. Isaiah says that when the Lord reigns, the world will be characterized by peace, righteousness, and justice (Isaiah 9:7). The amillennial response to this is usually to argue that we are in the Millennium because the Holy Spirit is in the world restraining evil. If the Holy Spirit were not here, things would be much worse. Thus, relatively speaking, we are in the Millennium. But the Bible doesn’t speak in relative terms about the Millennium. It states absolutely that there will be international peace, justice, righteousness and lovingkindness (Hosea 2:18-20). 2) Where is the Tribulation? — Augustine gave a startling response to this question. He said that we are simultaneously in both the Millennium and the Tribulation! We are in the Millennium because the Holy Spirit is restraining evil, but we are also in the Tribulation because the Church will suffer persecution until the Lord returns. When it was pointed out that the Bible says the Tribulation will last only seven years, Augustine dismissed the number as symbolic. He argued that the number seven represents a complete period of time, and therefore it represents the period from the Cross to the Second Coming. The book of Revelation says that the Tribulation will be a special, concentrated period of the pouring out of God’s wrath. In fact, it says that during the first 3 1/2 years, over one-half the population of the earth will die! The world has never experienced calamities of such magnitude. 3) Is Satan Bound? — This is a very critical question because the Bible says that Satan will be bound at the beginning of the Millennium (Revelation 20:1-3). Let’s keep in mind that there is a sense in which Satan has always been bound. He is not omnipotent. He is not free to do anything he desires. The book of Job reveals that Satan could not touch Job without God’s permission. It is true that Satan was further bound by the Cross. The reason is that since that time believers in Jesus have received the indwelling power of the Holy Spirit, enabling them to be overcomers in their combat with Satan. The Word says that “He who is within us is greater than he who is in the world” (I John 4:4). But the limitations which the Cross placed on Satan do not constitute the binding of Satan that the Scriptures say will take place at the beginning of the Millennium. Revelation says Satan will be bound so that he can no longer “deceive the nations” (Revelation 20:3). How can anyone argue that the nations are not deceived today? They are definitely deceived, and thus Satan is not bound. He is still the “ruler of this world” (John 16:11). 4) Where are the Two Resurrections? — The Bible says there will be two resurrections, one of the just and another of the unjust (Acts 24:15). It further states that these two resurrections will be separated by a thousand years (Revelation 20:5-6). The amillennial view has only one resurrection, occurring at the end of the Church Age. Augustine “solved” this problem by spiritualizing the first resurrection. He said the first resurrection is a spiritual one that occurs when a person accepts Jesus as Lord and is born again. The second resurrection is the one that will occur when the Lord returns and everyone, both the just and the unjust, will be resurrected from the dead. This exercise in imaginative interpretation shows what happens when you start spiritualizing. Scripture starts meaning whatever you want it to mean. 5) Where is the New Earth? — Augustine also spiritualized this concept. He argued that the “new earth” mentioned in Revelation 21 was simply a symbol for Heaven. But the Bible teaches that the earth is eternal. Psalm 148:6 says that the creation has been established forever and that the Lord has decreed it will never pass away. Psalm 78:69 says the Lord has founded the earth forever. In Luke 21:33 Jesus said “heaven and earth will pass away,” but He meant that in the sense that Peter tells us that the heavens and earth will be consumed with fire in order to be replaced by “a new heavens and a new earth” (2 Peter 3:10-13). The Bible never speaks of the material universe coming to an end. Rather, it promises over and over that this earth, including the plant and animal kingdoms, will be redeemed. It is all going to be restored to its original perfection. Read Isaiah 11:6-9 and Romans 8:18-23. Revelation 21 tells us point blank that the redeemed are going to live eternally in a New Jerusalem located on a new earth. Further, it says that God is going to come down to the new earth and live with us. The Bible never speaks of us living eternally with God in Heaven. To spiritualize all this is to make a mockery of Scripture. 6) Is God finished with the Jews? — Amillennialists claim that “God washed His hands of the Jews” because of their unbelief, and He therefore has no purpose left for them. This is a pernicious doctrine that has led to much anti-Semitism. The fact of the matter is that the Jews are still the Chosen People of God, and the Lord intends to fulfill every promise He has ever made to them as a nation. Likewise, in Romans 11:1 Paul asks, “Has God rejected His people?” Again, for almost two thousand years the Church has answered, “Yes!” But what does Paul say in response to his question? He says, “May it never be!” And then he adds, “God has not rejected His people whom He foreknew” (Romans 11:2). He then proceeds to explain that a great remnant of the Jews will be saved in the end times (Romans 9:27; 11:25-32). The Jewish people have been set aside as a result of God’s discipline. But He has not forgotten them. In Isaiah 49:16 the Lord says He could never forget the Jewish people because He has them tattooed on the palms of His hands! In Jeremiah 31:35-37 the Lord asks, “When will the offspring of Israel cease to be a nation before Me?” His answer is that they will continue to be special in His eyes until the fixed order of the universe departs or until the day all the heavens and all the oceans have been fully explored. In Romans 11:29 Paul says that the “gifts and calling of God are irrevocable.” And in Romans 9:1-5 he speaks of promises to the Jews that God fully intends to fulfill. That’s the reason the Jews are being regathered from the four corners of the world right now. It is one of the greatest miracles of history. The Lord intends to provoke them to repentance by bringing all the nations of the world against them (Zechariah 12:1-3). When they become totally desperate, they will look to the Lord for their salvation. That is when they will repent. They will “look on Him whom they have pierced, and they will mourn” (Zechariah 12: 10). 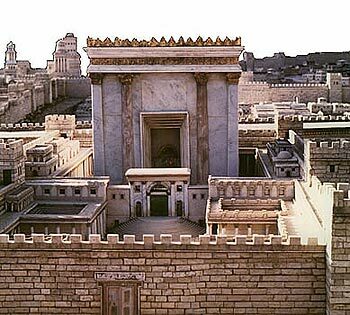 And on that glorious day, a fountain of salvation will be opened for the house of David (Zechariah 13:1). God will then establish these believing Jews as the prime nation of the world during the Millennium, and through them He will once again bless all the nations on earth (Isaiah 60-62). 7) Has the Church fulfilled the kingdom promises? — There is no doubt that the Church is God’s kingdom on the earth today. But the Bible does not teach that the concept of the kingdom of God is limited solely to the Church. I believe a review of Scripture shows that God has always had a kingdom upon this earth, but it has been manifested in different ways. The kingdom was originally expressed in the Creation itself (Psalm 93:1-2), through its perfect obedience to God’s will. When the Creation was corrupted through the sin of Man, the kingdom became expressed in the lives of the Patriarchs who, like Job, responded obediently in faith to God’s will. The kingdom became focused in a more tangible manner after the call of Abraham and the emergence of the nation of Israel (Exodus 19:6). Since Pentecost, the kingdom has been expressed in the institution of the Church (Colossians 1:13). But the Bible promises different expressions of the kingdom in the future first, in the form of a thousand year rule of Jesus upon this earth (Revelation 2:26-27), and second, in the form of an eternal rule of God upon a new earth (1 Corinthians 15:24-28). The kingdom is past, present, and future. It is currently expressed in the Church, but it is like a rose in the bud, yet to bloom in its full glory. The kingdom has always been coming, and it will continue to come until God’s will is done perfectly on earth as it is in Heaven. Even during the Millennial reign of Jesus, the kingdom will be coming, for the Bible teaches that rebellion will be lurking in the hearts of men (Revelation 20:7-10). The consummation of the kingdom will not come until all enemies of God have been subdued. That will occur at the end of the Millennial reign of Jesus, at which time He will surrender the kingdom to His Father, and God Himself will reign forever over a redeemed creation (1 Corinthians 15:24-28). The amillennial view is based on a spiritualizing approach to Scripture which contends that the Bible does not mean what it says. It is a consistent view for theological liberals who also spiritualize the creation week, the miracles, the virgin birth, and the resurrection of Jesus. But what is astounding is the number of conservative Christians who endorse this view. In effect, they take the position that the Bible always means what it says unless it is talking about the Second Coming of Jesus! 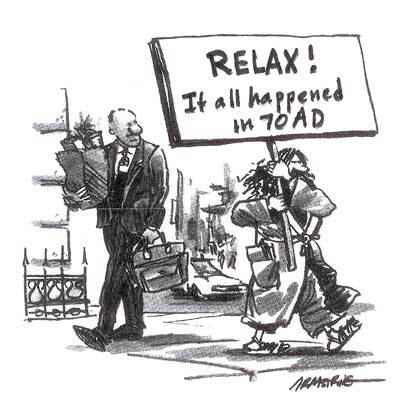 The amillennial view does not stand the test of either the Scriptures or reality. How can anyone truly believe that we are currently living in the Millennium? Society is disintegrating before our eyes, and the Bible says it will get worse the closer we come to the Lord’s return (2 Timothy 1-5). How can anyone truly believe that Satan is bound today? The Bible says “the whole world lies in the power of the evil one” (1 John 5:19). How can anyone truly believe that the Church is reigning with Christ over the nations? Try telling that to persecuted and suffering Christians all over the world. How could anyone truly believe God has no purpose left for the Jews? After 2,000 years of dispersion all over the world, they are being regathered to Israel in what Jeremiah calls a miracle greater than the deliverance from Egyptian captivity (Jeremiah 16:14-15). Let’s stop playing games with God’s Word. Let’s allow it to mean what it says. Bible prophecy is really not hard to understand. It’s just hard to believe. If you will believe it, you will understand it. 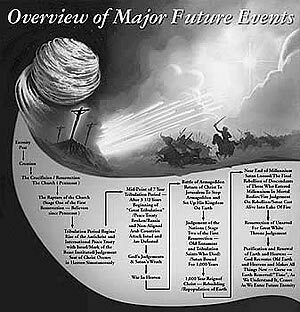 Does it really make any difference what you believe about the end times? Many Christians like to say, “I don’t know what is going to happen, so I’ve decided to be a pan-millennialist’ because I figure it will all pan-out in the end.” That’s a copout. It reflects the attitude of a person who is too lazy to search the Scriptures to see what God has promised in the future. Certainly it matters what you believe about Bible prophecy. It matters what you believe about anything, because your beliefs determine the way you live. I grew up in an amillennial church, and the result was that I lived with little hope because I did not know about God’s glorious promises concerning the future. I never looked forward to the Lord’s return because I had no idea what was going to happen when He burst from the skies. I had no eternal perspective, and I had no appreciation of the continuing significance of the Jewish people. When I began to study and believe Bible prophecy, my hope surged, and I was motivated as never before to live a holy life. I began yearning for the Lord’s return because I became dissatisfied with this world. And I developed an even greater appreciation of God’s unfathomable grace as I marveled over His continuing love for Israel. What you believe about Bible prophecy has no effect on where you are going to spend eternity; it is not related to your justification. But it has an immediate impact upon your sanctification, upon how you walk before the Lord in this life. As the apostle John put it: “Everyone who has his hope fixed on Him purifies himself, just as He is pure” (1 John3:3).